Why swim when you can fly... underwater! The SUBWING is the newest watersport for those wanting to explore under the sea while enjoying an exciting underwater ride. 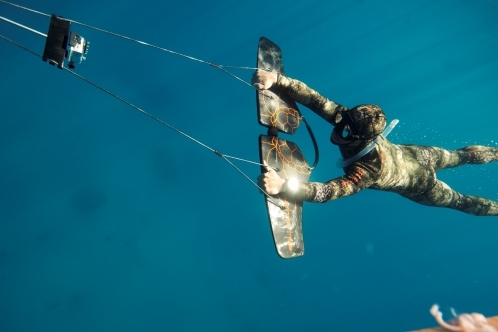 One of the benefits of the SUBWING is its ease of use, with first-time users needing little training before they are rolling and diving underwater and resurfacing with minimal effort. 'Riding the SUBWING will make you feel like you're flying underwater and it gives the rider a sense of dolphin-like freedom' says Director of SUBWING, Mats Westgård. The Luxury Travel Bible also loves the story behind this new watersport product that allows riders to perform impressive acrobatic manoeuvres under water. Aged 18 and circumnavigation around the globe with his brother and father, SUBWING designer Simon Sivertsen's starting point was a piece of driftwood attached by a waterski rope to their boat. Wanting to experience the clear waters of the Greek islands he conceived his idea for an underwater wing to provide speed in the water. 'The idea worked and I was able to control the up/downward moment without too much effort. But it was far from perfect and felt somewhat static, like a 2D videogame, it was missing a third dimension' he says. After sailing to Italy, the idea had evolved on paper for two separate fins connected together with a twistable joint. Simon visited a local supermarket to purchase two chopping boards, some gardening hose connector links and some fiberglass. Despite his limited access to proper tools, the first SUBWING was created at sea. Soon the dream for navigating the globe was put on hold in order to develop the SUBWING further. The SUBWING will be exclusively available for guests of The Peligoni Club, Zakynthos. The SUBWING will be launched during the 'Beach the Blackberry' fortnight from 19th June to 3rd July 2014. 'Beach the Blackberry' is aimed at young professionals wanting to relax with like-minded luxury travellers, while leaving their ever-present phones, tablets and laptops behind at the office . The clear warm waters will be an ideal location for testing out the SUBWING, which joins the Peligoni Club's range of water based activities. 'Beach the Blackberry' includes Club Membership, breakfast and dinner each day and car rental. For further information visit www.peligoni.com or call 0208 740 3001.